I’m psyched to share an upcoming release from my fellow WRW author, Mary Behre. I’m reading her debut novel, Spirited, right now. 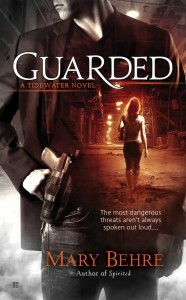 I”m looking forward to Guarded too. It’s out on 8/5 and available for pre-order at this very moment, so check it out! Mary Behre is the author of The Tidewater Series. Stories with humor, suspense, and a psychic love-connection. Her debut novel, SPIRITED (Tidewater Novel #1) was an award-winning manuscript before it sold to Berkley Sensation. GUARDED (Tidewater Novel #2), is already receiving praise from reviewers and readers. The Tidewater Series features three sisters separated years before in the foster care system. They search for love, each other, and a way to live with their psychic abilities. In each book, they’re tossed into the middle of mysteries that only their unique gifts can help solve. 12 Steamy Novels. One Sizzling Price! COVER REVEAL: HUNTER BY NIGHT!